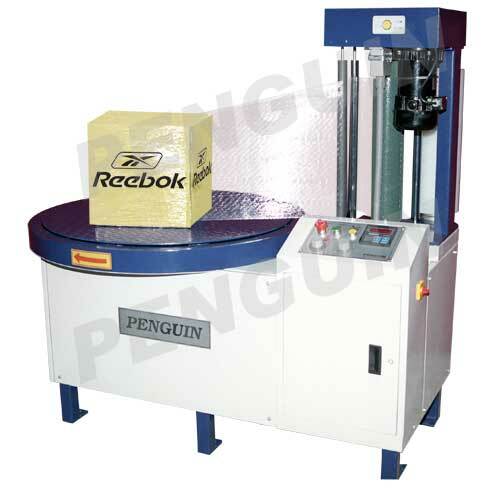 The Penguin Box Stretch Wrapping Machine (Model: Compact) is a simple and convenient device to wrap carton boxes and objects of similar geometry using stretch film delivered from “The-State-of-Art” Powered Pre-Stretch Unit. Stretch Wrapped Protection can be given to small & medium sized objects packed in carton boxes, cans, tins, drums, etc. • Provides an inexpensive method of protecting carton boxes and similar products from moisture and damage during transportation. • Wraps using stretch cling film. • Very high throughput – up to 120 packs per hour. • Easy manipulation of load to provide bi-directional wrapping. • Suitable for Apparels, Garments, computer components, handicrafts and food products packed in Carton boxes. • Optional - Pneumatic cylinder with top platen models. Industries manufacturing Goods like Computer monitors, Domestic pumps, Electrical & Electronic Goods, Engineering items, Cosmetic items, Consumer goods etc., have to pack huge quantity of their valuable products kept in Carton Boxes daily. 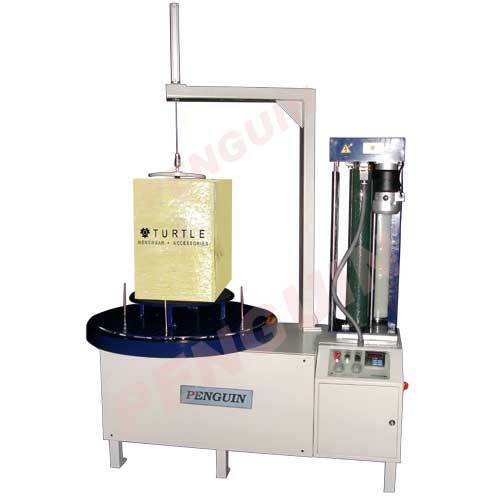 Penguin Stretch Wrapping Machine – Model COMPACT, is suitable for packing the above consumer goods quickly while giving additional protection too. This simple to operate, table-top model machine consists of a motorized variable speed Turn Table, so that the operator can conveniently stand near the machine and stretch wrap the carton boxes / products quickly. The 'powered pre-stretch' unit stretches the LLDPE stretch cling film upto 300%, so as to cover the products consuming least quantity of stretch film. This results in very low packing cost. About 120 Boxes per hour can be easily stretch wrapped using this machine. This machine enables Industries manufacturing items as above to drastically reduce the hands in packing department; to give added attraction and protection to the printed carton boxes containing valuable products inside; to considerably save total power costs, when compared to shrink wrap system. This machine is suitable for products weighing upto 50 Kgs, & requires only 220V, 1-phase, 15 Amps & 0.75 kW power supply.